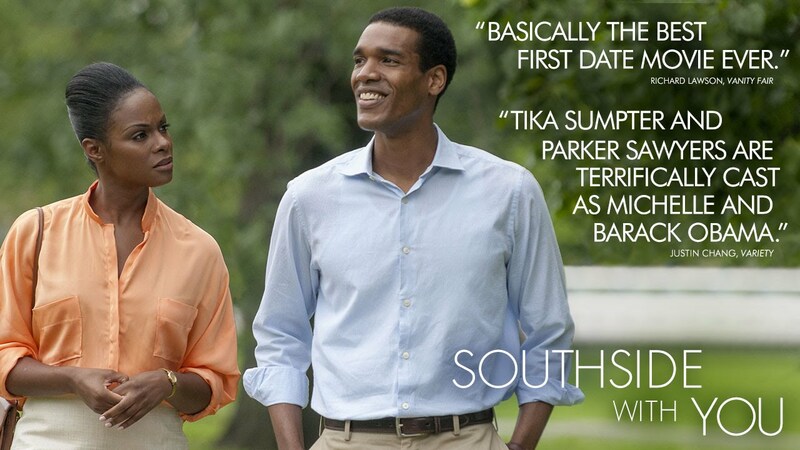 Southside with You has an unlikely inspiration: the first date between Barack Obama and Michelle Robinson, in Chicago in 1989. Barack and Michelle would marry three years later, but Michelle was resistant to the young law student at first. She was his liaison for his law internship at her firm that summer, and she was wary of how the firm would view any attachment between them—and of his smooth confidence. The movie takes place over one entire day. Barack asked Michelle to go to a community meeting with him, but after he picks her up, he sheepishly announces the meeting isn't for another few hours. They go to a museum, then lunch in a park, then the meeting, then a movie, and finally the drive home. This is the first thing I like about the film: its unusual structure. Each event has its own atmosphere: the feel of the streets at morning or night, the changing light and sky. And each event moves their relationship forward, though not always in a straight line. Also, I suspect that most couples have a day like this—a moment early in their relationship where they spent all day long together and that remains memorable because of what was revealed over the course of that many hours together. There have been apt comparisons to Before Sunrise, but I think this film is actually better because more happens. Before Sunrise is a bit of a slice of life, but Southside with You is that plus more. For one, it's funny. Michelle comes from an accomplished family, and when Barack pulls up in his disintegrating yellow Datsun, Michelle climbs in and finds a rusted hole where her feet should go. Tika Sumpter plays Michelle, and her wry disapproval of Barack is played a little too often—the script's fault more than Sumpter's, I think. But still—funny. The acting would be virtue number two. Sumpter is a good, solid Michelle: grounded, smart, independent, and lively. But Parker Sawyers is a brilliant Barack Obama. There were times when I had to remind myself that it was an actor and not really Obama on screen. He was the closest to the real subject that I've seen in any biopic. But it's more than just mimicry. Sawyers creates a plausible version of his subject as a young man on the brink of his future. Michelle can see, and we can too, that he could almost go either way. He's so adored by those around him (the folks at the community meeting, for example, not to mention the partners at the law firm), and he's just on that edge between confident and arrogant. Here's where the day-long format works to advantage. The film provides opportunities for Michelle to see past what might look like overweening cockiness. She's annoyed that he misled her about when the meeting started, but they go to the Art Institute of Chicago, and their mutual absorption in the art brings them back together. They go to the meeting, and the neighborhood's almost cloying love for him makes her roll her eyes; but that's countered by the realization of his obvious investment in these people's lives and community. Obama's speech at the community meeting was one of the weaker moments of the movie, but only because of the frequent cuts to members of the audience looking skeptical and then eventually nodding sagely. The director could have used a lighter hand here. But the speech itself was everything it should have been, showing his incredible oratory and his unshakable belief in the power of pragmatic, incremental change. While the community's appeal for a recreation center has been turned down, Obama urges them to take "no" as "on"—as in "carry on." The no is just a first step. Then you figure out why they said no and what you can do to address that before trying again. This principle comes in handy when they go to see Do the Right Thing and Michelle's worst nightmare comes true. They are spotted together by a senior partner. They muddle through, but Michelle gets in the car with a declaration: "now this [meaning them] will never happen." Now he is driving her home and they are subdued. But if we think he's leaving it at that, we don't know Barack Obama. He pulls the car aside at a Baskin-Robbins. Earlier in the day he had bought her a piece of pie, but she turned him down: "I'm more an ice cream kind of girl." As he said at the meeting, figure out someone's objection and then address it. The sweetness of the gesture and his determination, which is insistent but also gentle and respectful, creates an opening for them. The give and take between them is so key. They are both brilliant and accomplished, but otherwise quite different. She has the most solid of loving families, and he was essentially abandoned by his parents. She is cautious, and he is daring. He challenges her to be less fearful. She challenges him to forgive his parents. Parker Sawyers' understated portrayal of Barack's pain in this regard is just beautifully done. The director, Richard Tanne, never lets the characters slip into caricatures or types. She's serious but not prissy. He's smooth but also soulful. Likewise the film itself is never a caricature or a type. It has its own unusual rhythm and feel. Quiet and leisurely in a way, it's never political or obvious. But I found it quite extraordinary. Not perfect, but beautiful.